Prutting employee Dylan Wolf founded The World Energy Foundation (501c3) in 2013. 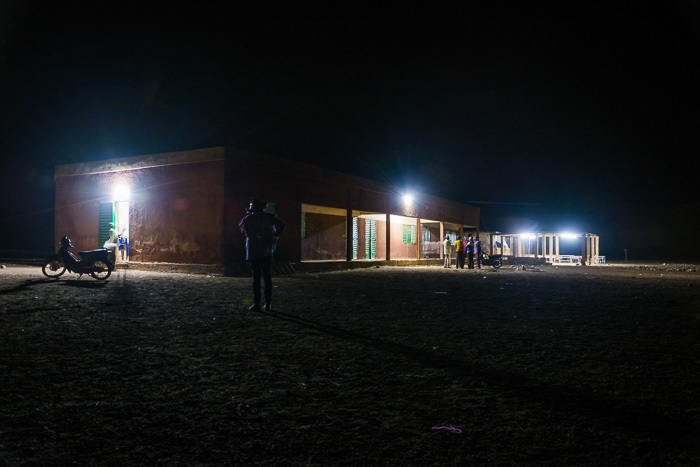 Since then, five TWEF solar power projects have been installed in communities in Burkina Faso, West Africa at schools and health centers. These systems have been providing light and power that helps students study longer and doctors treat patients more effectively. Read more about The World Energy Foundation’s work and if you’d like to make a contribution to upcoming solar installations in West Africa and Honduras click here. As always, 100% of your contribution goes to clean energy projects. The World Energy Foundation (TWEF) is a non-profit organization dedicated to human progress and the protection and preservation of nature on a global scale. Their mission is to deliver affordable, clean, reliable, and sustainable energy to communities in developing countries that currently lack access to electricity, with initial interventions focused on providing power to educational and healthcare facilities. Their projects, which begin as site-specific sustainable energy equipment installations, grow into community-wide economic development initiatives, with the end goals of alleviating poverty and promoting shared prosperity on a foundation of clean, sustainable energy. TWEF’s founders and staff are versed in engineering and sustainable energy technologies, however, for individual projects they do solicit the expertise of engineers, meteorologists, and local community leaders to contextualize the specific conditions of the local environment and the needs of the community in question. Insights gleaned from this process enable them to design and deploy sustainable technology solutions targeted precisely to a community's needs. Their initial interventions will install renewable energy systems to educational and healthcare facilities, sites of maximal individual benefit and effect. To ensure that their installations will endure and indeed be expanded upon in the future, they prioritize community capacity building via the training of community residents in technology maintenance and upkeep, as well as educating the community as a whole as to the benefits of their sustainable energy systems. Training on-site technicians is done both in person and remotely; it includes fundamental instruction regarding the physical and mechanical aspects of the energy system, and best practices for proper hardware maintenance and monitoring. Sponsorship of community-wide town hall discussions and free educational programs further engage community members to ensure their understanding and appreciation of the technologies at work. Special emphasis is placed on gaining the active support of community leaders and school and hospital administrators. Real-time monitoring and data analysis are central to the process. They install information and communication technology (ICT) applications with every energy system they establish, to collect data on energy usage, peak- and off-peak load demand, equipment malfunctions, etc. Via human reporting they also collect qualitative data concerning the community’s educational awareness, health outcomes, and economic development and productivity in the wake of the system installation. This anecdotal evidence will give context to quantitative data points culled from ICT, and will allow for accurate measurement of progress against benchmarks established at the beginning of each project. Collected data is monitored and analysed in real time to optimize remote diagnostics and ground-based response time. Over the duration of a program they review community progress indicators, track trends in future sustainable equipment prices, and work directly with community leaders to plan for their eventual inheritance of the costs and responsibilities of upkeep after TWEF’s active involvement comes to an end. Visit www.theworldenergyfoundation.org to learn more.